When you're in a shortlist of players including Liverpool's Mo Salah, Manchester City's Kevin de Bruyne and Spurs striker Harry Kane for a coveted award you've got to be doing something right. 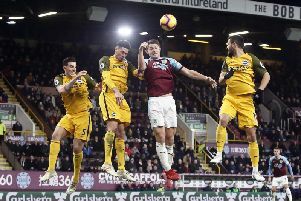 Goalkeeper Nick Pope's contribution for the Clarets this season earned recognition from the Football Writers' Association in their Football of the Year category, with the gong going to Anfield's Egyptian wizard. Pope was among those considered for the accolade with Sergio Aguero, Christian Eriksen, Roberto Firmino, David Silva, Raheem Sterling and Jan Vertonghen also receiving votes outside the top three. "It was out of the blue really but it's something that I'm really happy about," said the 26-year-old. "It was a bit of a surprise to be honest, it may have been for a few people as well, but it's an honour to be included on a list with those players this season. "With the calibre of players in this league, to be on a list with them is something I could never have imagined." Pope, who signed from Charlton Athletic in the summer of 2016, also cleaned up at the player of the year night, held by the various supporters clubs. The former Addick was showered with silverware, claiming 11 of the 13 awards on offer, and it was his first haul as a professional. Pope, who has kept 13 clean sheets in all competitions this term, which brought his first international call up, said: "I don't know what to do with them. They're sat on the table tennis table. That's something I need to look at. "This season has flown by. We're sitting here with two games to go and I'm very happy. I feel like I've put in some good performances in my debut Premier League season. Everyone at the club is ecstatic with the amount of points that we've got on the board. "I'll get a bit of time in the summer to kick back, relax and think about things. It's probably not the right time to do it now. "Since I've been in the team I've been focussed on when the next match is and I've been preparing for that. Maybe I'll get to look back on it at the end of the season."